Meyari McFarland returns to the world of Mouse and Snake in a story of a mother’s love struggling to protect her child. Banan had never been violent. She left that to Nakato, her daughter Rafah’s best friend, and her other friends. But the relentless attacks against Rafah both emotionally and now electronically had her contemplating violence on a grand scale. As Banan ventured into the electronic world of the net, she discovered that the threats to Rafah were far greater than a mere broken heart. If Banan didn’t get to the heart of it, she could lose not only her daughter but also her life. 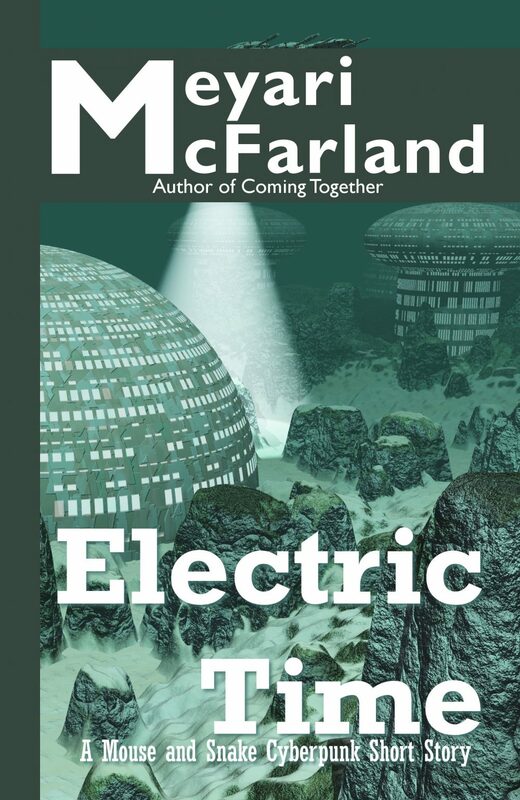 Electric time is a dramatic cyberpunk story set in a decaying future where global warming has won and humanity scrapes along in a world falling to pieces around them.